Forget-Me-Nots have a long tradition in Newfoundland and Labrador as a flower of remembrance. This year as we commemorate the 100th Anniversary of the battles of the Somme and Beaumont-Hamel, Newfoundland and Labradorians will once again wear the Forget-Me-Not as a symbol of remembrance. 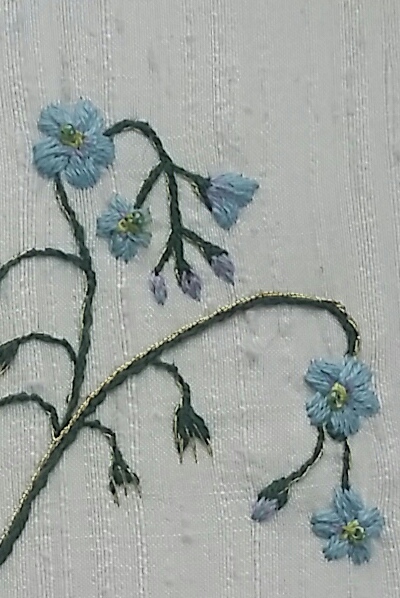 With silk thread and metal threads on dupioni silk ground fabric, we will stitch up a sprig of Forget-Me-Nots suitable for framing. Finished size: 5″ x 7″. We will cover basic stitches, beading, working with metal and how to mount your finished embroidery. Cost of workshop is $50 which includes all materials.